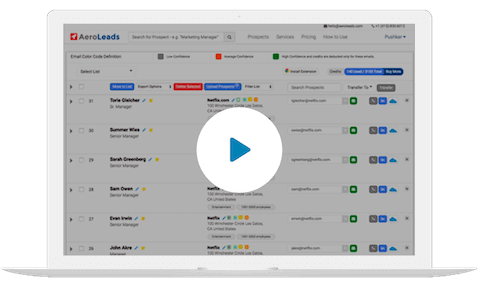 Find Email Addresses of Decision Makers and Phone Numbers of Businesses with #1 Prospect Generation and B2B Lead Generation Software on the Web. Build Email List in Real-time. Find Emails, Phone Numbers and B2B Data using our Chrome Plugin. Search, add prospects and leads at AeroLeads to get their Verified Email addresses and Business Phone Number. Find business emails of decision-makers with the title, location and company emails with phone numbers, address etc. Search a Domain, Business Phone Number or verify Email accuracy. Sign up to AeroLeads and install our free chrome plugin. Click Me! Go to LinkedIn, CrunchBase, AngelList etc and do your search for people. Add the relevant leads and prospects to AeroLeads using our widget. AeroLeads will find their business emails along with company name, company URL, job title, location etc. Find business emails and phone numbers with 1 click. Find as many as 10 data points like title, location, generic company emails etc. Transfer data to Salesforce, HubSpot CRM, Pipedrive, Zoho CRM, FreshSales, Zapier etc with 1 click. Rock solid support via chat, email and phone. AeroLeads Email and Phone Finder is used by hundreds of businesses, online marketers, sales teams, recruiters to find business details and b2b data. Go ahead and try us for free!